Work does not stop when weather gets cool, cold, or wet. When others feel the wind blowing a chill up their spine, you will have the protection you need. Our vests give freedom for your arms. 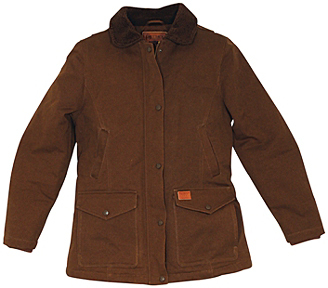 Feel like you own the wilderness in your rugged outdoor clothing! 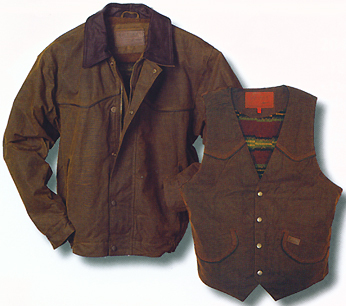 Our Outback outdoor clothing gives you everything you need to get the job at hand done. 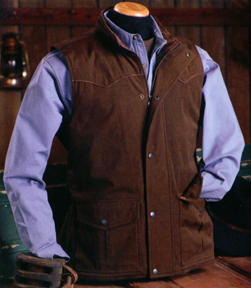 Blending traditional looks with hi- tech fabrics will keep you warmer and drier than you've ever been. 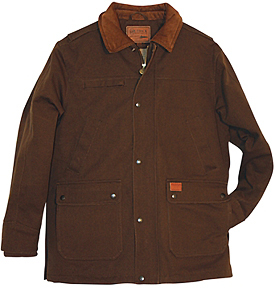 On cotton canvass work coats, you can use Scotchguard, or a similar waterproofing to keep your back and shoulders dry. 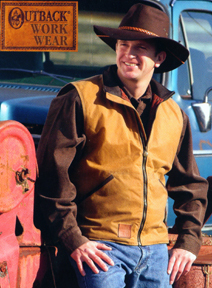 On oilskins, use the Duckback dressing. 12 oz. 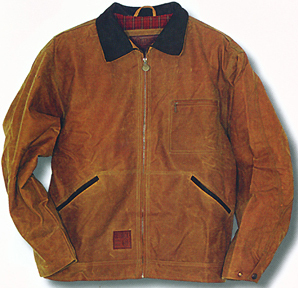 Oilskin Cotton canvas. Full zippered front with inside storm flap. Leather trimmed slash pockets and top collar. Elastic inserts at the waist. Longer length back covers when bending or reaching. Quilted brushed lining. Field Tan (shown), Sage (all with Brown Nubuck leather trim). 12 oz. Oilskin canvas. Waterproof. Waist length cut with expandable back for easy movement. Adjustable waist tabs & cuffs. Nubuck trimmed top collar, slash pockets and chest pocket. Quilted Brushed Lining. Brown (model shown, limited selection), Field Tan (Shown above right - newest color), (both with Brown Nubuck leather trim). This coat (or vest), is a fantastic pick for breaking the chill off of a cool morning, keeping the dew off your back without any restrictions. 12 oz. Oilskin canvas. Waterproof. Printed mini-berber fleece lining. Waist length. Nubuck trimmed top collar, slash pockets, Western yokes - front & rear piping. Brown (Bronze). 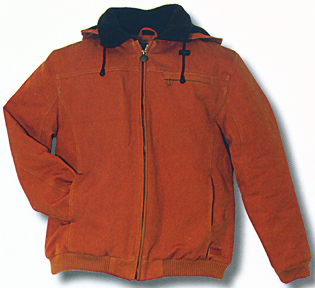 Jacket has placket covered zipper, elastic waist inserts and pockets. 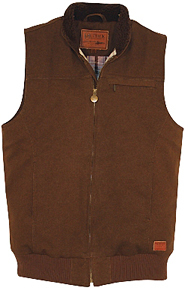 Vest has 4 snap front, back belt, & inside pouch pocket. Unisex. 12.5 oz. Cotton canvas with DWR water-resistant, dirt resistant finish. Lining is a Southwestern printed berber fleece with taffeta. Triple stitched Western yokes. Two-way zipper with storm flap underneath. Fleece lined drawstring hood. Lower slash pockets. Two inside pockets. Side elastic inserts on bottom hem. Colors shown below. Sizes: Med, Lg, XL, XXL. 12.5 oz. Cotton canvas with DWR finish. Water resistant. Insulated plaid lining, quilted taffeta in the sleeves. 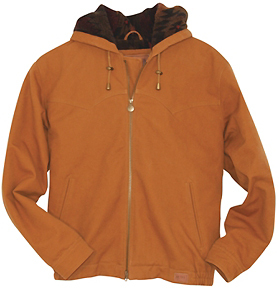 Brown berber fleece on the top collar and inside the detachable drawstring hood. Rib-knit bottom hem and cuffs to hold out trash and the cold. Expandable back for easy movements. Two-way zipper with storm flap underneath. Princess seams with pockets. Zippered chest pocket. Two inside pockets. Ladies Sizes: Sm, Med, Lg, XL. Choose Barley, or Wheat (shown). 12.5 oz. Cotton canvas with DWR finish. Water resistant. Insulated plaid lining, quilted taffeta in the sleeves. Ladies sizes Sm, Med, Lg, XL. Choose Barley (shown), or Wheat. 12.5 oz. Cotton canvas with DWR finish. Water resistant. Insulated plaid cotton lining. 12.5 oz. cotton canvas with DWR finish. Water resistant. Insulated brushed cotton mini-houndstooth lining. Quilted taffeta in the sleeves. Corduroy top collar. Rib knit storm cuffs in the sleeves. Snap over storm placket covers two-way front zipper. Dual entry flap protected lower pockets. Torso handwarmers. Zippered chest pocket & two inside pockets. 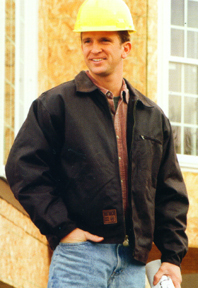 The Stockman coat can give you an independent attitude, while keeping your back covered. Choose Barley (shown), Black or Wheat. 12.5 oz. cotton canvas composite fabric with DWR finish. Water resistant. Longer than normal length lets you keep the wind away from your back. And, a more comfortable pocket placement. Yes, those pockets are large enough to be useful for more than a pocketwatch. Printed mini-berber fleece and quilted taffeta lining assures your body core will be warm. Triple stitched Western yokes. Placket protected two-way zipper. Snap open back vents. Side waist adjustment. Dual entry outside pockets. two inside pockets. Available in all the colors below.